Cough is an essential way in which the lungs expel unwanted material. It is a protection for the more fragile areas of the lungs. Unfortunately cough can be distressing particularly during the night. 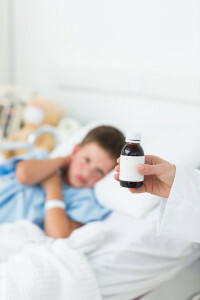 There is little role for cough medicines in children though they are marketed very well. The most common cause of cough is viral infection of the upper respiratory tract. Antibiotics have effect on these coughs. The word bronchits means inflammation of the large airways. There is generally little role for antibiotics in the management of bronchitis in children. A cough itself is rarely serious with the exception of whooping cough. Coughs are generally described as moist, ‘chesty’, dry, barking, or wheezy. The severity, nature and intensity of a cough will often concern parents and is one of the most common reasons for going to the doctor with your child. Some children will cough enough to vomit, which is quite distressing. When is a cough serious ? The cough has been productive and moist for 6 weeks or more. Many parents are concerned about pneumonia or ‘chest infection’. They feel that a moist phlegmy cough is a sign of this. If a child has pneumonia the lungs will be involved and the child will be unwell, with high fevers, lethargy, and trouble breathing. Most phlegmy coughs are part and parcel of upper respiratory tract infections which do not require intervention such as antibiotics. Unfortunately antibiotics are often over prescribed for coughs and colds. What do the types of cough mean ? A moist or chesty cough will indicate the airways are trying to expel moist phlegm. Usually this will come from the upper airways. This is the most common cough and will occur particularly during the night when a child or infant is lieing down. Sometimes these coughing episodes result in vomiting. Often the coughing is worse when the child wakes in the morning and improves during the day. A wheezy cough particularly in toddlers will be seen with viral illnesses. This group may need some treatment. See wheeze associated with respiratory illness. A cough that is persistent and there are prolonged fits with 10 to 20 repeated coughs, without any breaths between is called ‘paroxysmal’ and sometimes can indicate whooping cough. Older children will sometimes have a daytime cough that is either throat clearing in nature, or a loud honk. It disappears at night and there are no other symptoms to suggest the cause. The child is well, healthy, exercising and sleeping normally with normal appetite. This is most likely a ‘habit cough’. These can be triggered by a ‘cold’ and will last a few months. There is no real treatment but it can be a frustrating period. These children are often wrongly diagnosed as having ‘asthma’ or an infection. This depends on the cause. Most coughs are due to viruses and there is no real evidence that cough mixtures or remedies have any affect. At night simply sitting the child upright and drinking something will ‘reorganise’ the upper airways and may enable some relief. For wheezy coughs in infants see the section on bronchiolitis. For toddlers see the section on wheeze. 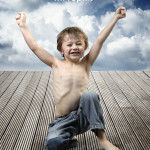 Parents will find cough very frustrating, as do doctors who feel helpless at times when clearly the only cure is time. Some parents use vaporisers, though there is no evidence these help. When Should You see A Doctor ? Infants – Those under the age of 3 months should be reviewed by a health professional to ensure there is a simple explanation with any cough. For older infants if the cough is associated with temperature, feeding difficulties, problems sleeping, shortness of breath, vomiting or significant fever, then an assessment by a health professional would be advisable. If unable to see your doctor attending an emergency department is appropriate. Toddlers and children – here cough is common and often recurrent. Sometimes a cough will last 4 – 6 weeks after a virus, then after a brief period an new cold will start the cough again. This is common and frustrating. If there is shortness of breath, coughing occurring throughout the day, or the child is unwell with a significant fever then it is advisable to make an appointment with your doctor. If the child appears happy, functions well during the day and the cough is not causing too much distress there is little that needs to be done. If your child has not been vaccinated and the cough becomes significantly worse, with severe coughing episodes that result in vomiting then whooping cough needs to be considered.